Trying something new doesn’t always go smoothly the first time. Golf, baking, parallel parking—many people experience difficulty, stress and frustration the first time they tackle these tasks. Fly casting was one such endeavor for me when I first tried my hand at it. In fact, I became so frustrated with it that I nearly gave up on fly fishing altogether. I was fortunate, however, to have the counsel of a friend who was a fly angler, who helped identify where I was going wrong. Here are the five easy steps he guided me through to help fix my fly casting. 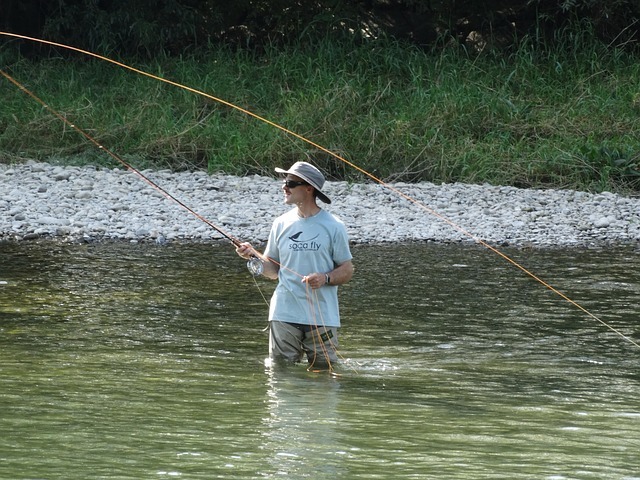 When they’re first learning to cast a fly, most newcomers find that a forward cast is easier. This is because they can watch their fly line and make adjustments as needed. Where most struggle, though, is their backcast, because it’s hard to see behind you and remedy any casting errors, such as hitting the water or the ground behind you with your line. This results in shoddy backcasts and ultimately, a poor cast overall, as well. Like most things, patience and practice will go a long way towards improvement. For new fly anglers struggling with their backcast, practicing the technique in their backyard can be a big help. You’ll need a target in order to practice in your yard, such as a hula hoop or a paper plate if your accuracy is on point. These targets are where you’ll want to place your fly on the forward portion of your cast. Once you have a target and the space to practice, there are 5 steps to work through in order to fix your casting. First, stand sideways to the target, with your feet spread comfortably. Next, lower your rod so that it’s parallel to the ground and use a sidearm cast instead of an overhand one. Now make sure to watch the line as you make your back and forward casts. Then, adjust your timing and stroke until the cast is smooth and the line forms narrow loops forward and backward. Finally, face your target and cast with an overhand motion now, instead of a sidearm. By following these 5 quick steps, you’ll find that the timing and motion of your casting remain nearly identical, even though you’re changing from a horizontal to a vertical cast. Pretty easy, right? All you need to do is practice sidearm, facing away from the target so you can see the entire cast and then continue the arm motions and cadence with an overhand cast once you’ve got the rhythm down. next articleYeeeee Haw! It’s Monster Truck Thunder!